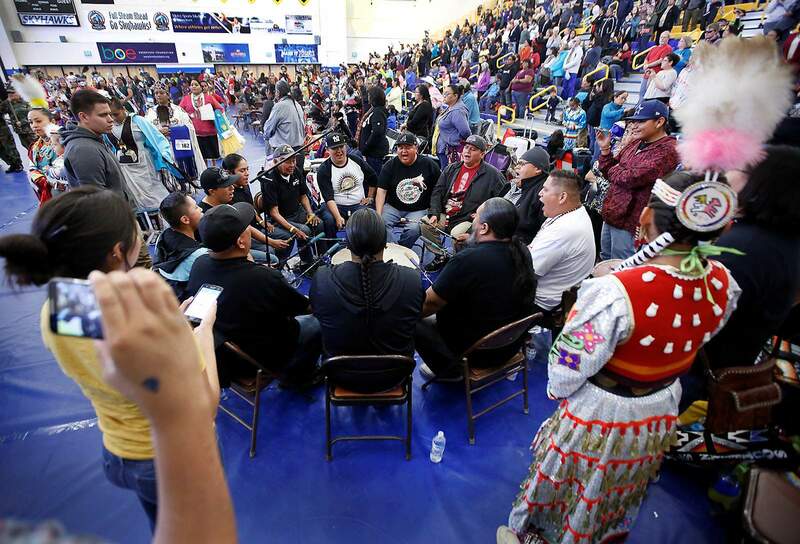 Southern Style, from Red Mesa, Utah, perform at this year’s Hozhoni Days Powwow on Saturday in Whalen Gymnasium at Fort Lewis College. Hozhoni Days – meaning “days of beauty” – is a monthlong celebration of Native American cultures. Dancers take to the floor during the Grand Entry on Saturday at the Hozhoni Days Powwow in Whalen Gymnasium. As the dancers move to the rhythmic beat of the drum, they tell the story of their tribal affiliation, ancestry and spiritual journey. 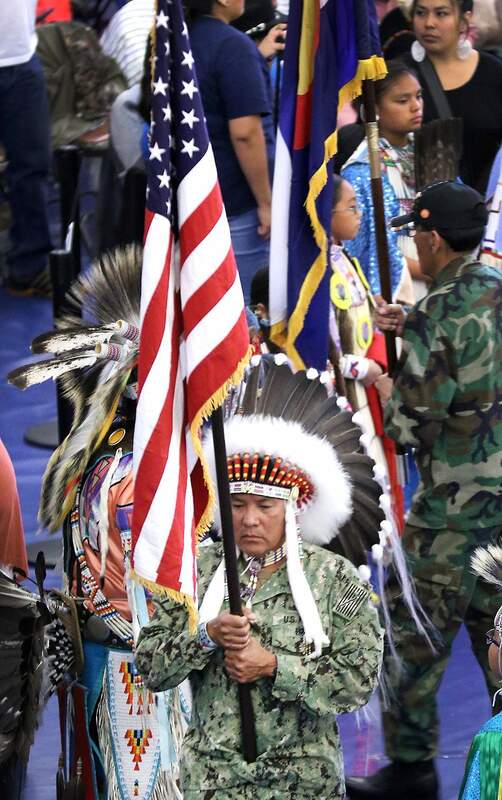 U.S. Navy veteran Raymond Baker of Durango carries the American flag during the Grand Entry on Saturday at the Hozhoni Days Powwow in Whalen Gymnasium at Fort Lewis College. Grand Entry participants gather during the annual Hozhoni Days Powwow on Saturday in Whalen Gymnasium at Fort Lewis College. 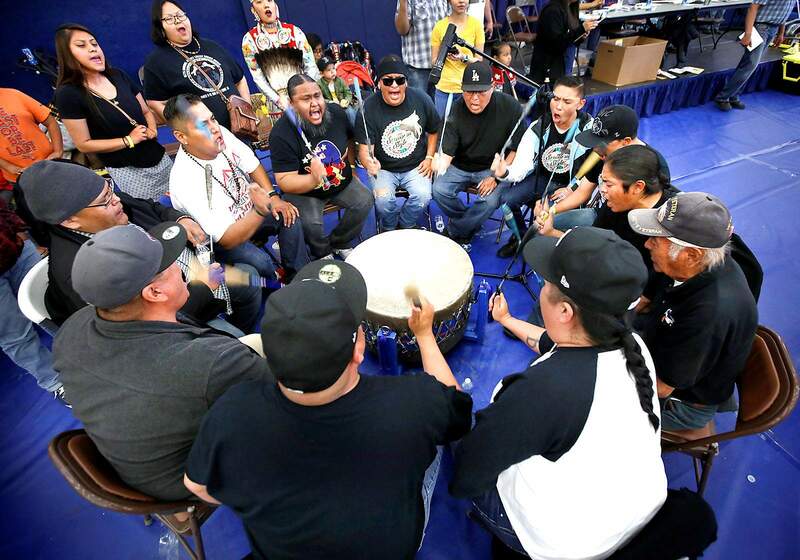 Southern Style, from Red Mesa, Utah, perform at this year’s Hozhoni Days Powwow on Saturday in Whalen Gymnasium at Fort Lewis College. 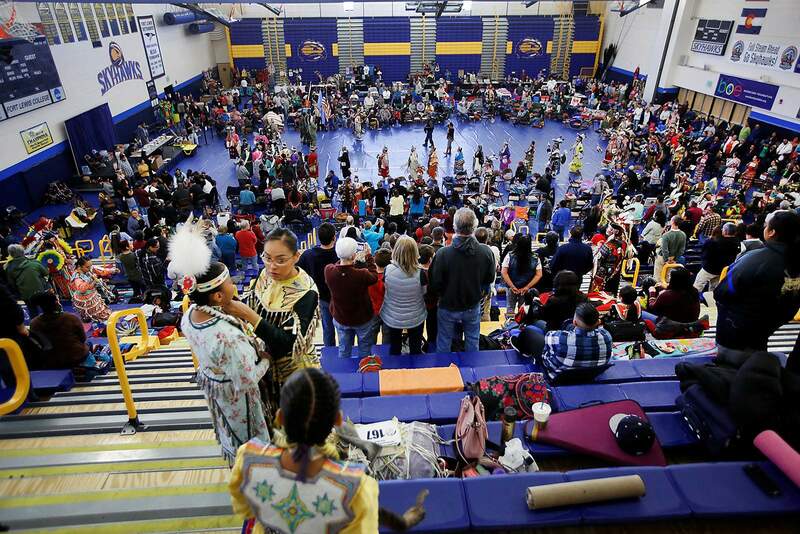 Whalen Gymnasium at Fort Lewis College was awash with color Saturday as more than 50 tribes from around the nation were represented at the 54th annual Hozhoni Days Powwow. 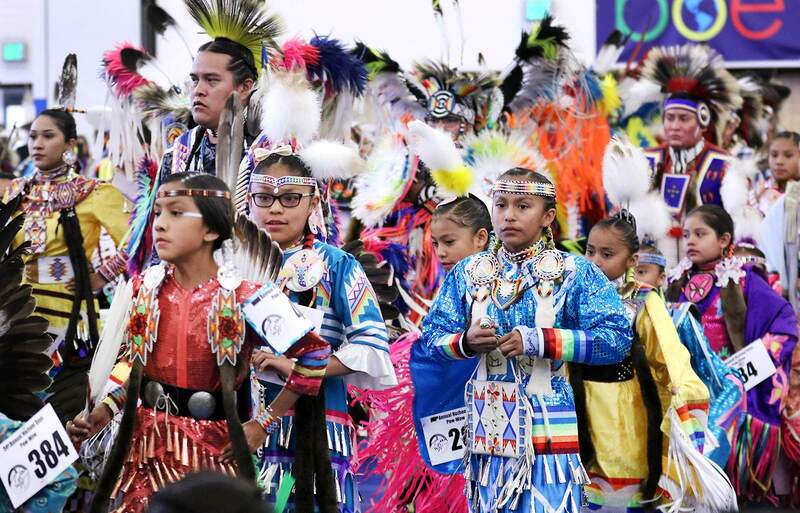 Hozhoni Days – a Navajo name meaning “days of beauty” – is a monthlong celebration of Native American cultures. It is FLC’s longest-standing student-led tradition, dating back to 1966 when the Shalako Indian Club – an early version of today’s Wanbli Ota – created the event to promote cultural diversity on campus. Rowena Becenti, who is Navajo, helped organize Hozhoni Days back when she was a psychology student at FLC in the ’80s. On Saturday, she attended the event as a jewelry vendor with her husband, Eddie Dimalanta. Dimalanta, who is Lumbee, creates wampum – decorative beads made from whelk and clam shells. Becenti said she cannot overemphasize the significance of Hozhoni Days because it’s a time when the college shows support for its Native American community on campus. “It gives them the chance once a year to dance and share work with friends,” she said. There are more than 500 federally recognized tribes in the United States, and each differ widely in history and culture. The celebration featured Native American dancers, singers and performers. Each dancer was a vibrant reflection of tribal history, embodying the spirit of the culture. Some wore hand-beaded regalia in the colors and patterns of their tribes; others wore dresses with multiple rows of metal cones that create a jingling sound as the dancer moves. Natasha Brokeshoulder of the Navajo Nation performed the southern claw, a style of dance with slow movements that focuses heavily on the beat of the drum. Brokeshoulder said her mother-in-law taught her how to dance. Each style of dance tells a different story, Brokeshoulder said. As the dancers move to the rhythmic beat of the drum, they tell the story of their tribal affiliation, ancestry and spiritual journey. Brokeshoulder’s husband, Randy, has been dancing for almost 30 years. He often performs the grass dance, a style of men’s powwow dancing originating in the warrior societies on the Northern Great Plains. He is Absentee-Shawnee, Navajo and Hopi. The grass dance is a fast-paced dance with sweeping motions. Hozhoni Days also includes the Ms. Hozhoni Pageant, which crowns a winner to represent Wanbli Ota and the college’s Native American community for the next year. Contestants are judged on public speaking, traditional food presentations and talent performances. She said it was an easy question. Yazza, who is Navajo and Zuni, takes comfort in Hozhoni Days because it’s like a little slice of home. “It brings home to school,” Yazza said.